Supporters of Kenyan opposition leader Raila Odinga carry banners during a rally at Uhuru Park in Nairobi, Kenya October 25, 2017. 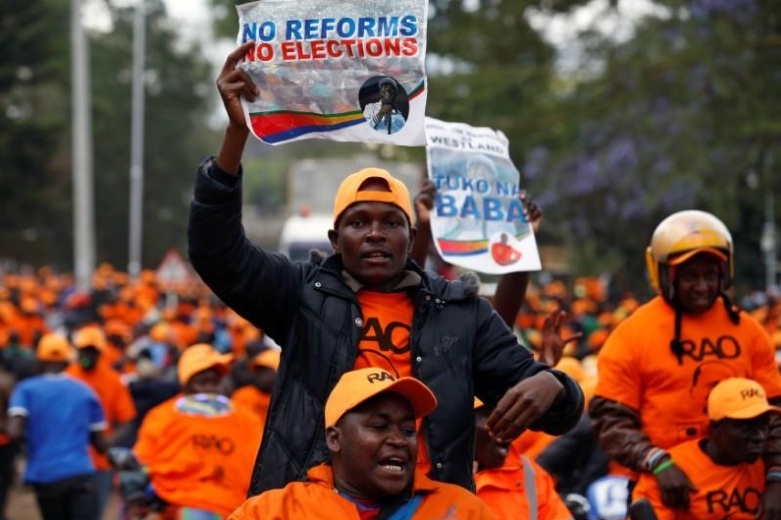 NAIROBI - Kenya plunged deeper into crisis on Wednesday after a no-show by the majority of Supreme Court judges scuppered an eleventh-hour petition to delay a presidential election and the governor of a volatile opposition region endorsed rebellion against the state. Within minutes of Supreme Court chief justice David Maraga announcing that five judges had failed to turn up, preventing a quorum, hundreds of supporters of opposition leader Raila Odinga took to the streets of Kisumu, his main stronghold. Riot police used teargas to disperse them. Odinga had successfully challenged the outcome of an initial ballot in August, which he lost, in the same court. “We were expecting Maraga to cancel (Thursday‘s) elections. This means the push for postponement of the election is on,” said George Mbija, a motorcycle taxi driver in the western city, repeating an Odinga demand for a clear-out of election board officials. The opposition leader has called on loyalists to boycott Thursday’s vote, because he said the election board’s failure to institute reforms means it will be neither free nor fair. Kisumu governor Anyang Nyong‘o, a hardline Odinga supporter, went a step further. “If the government subverts the sovereign will of the people ... then people are entitled to rebel against this government,” Nyong‘o told reporters in Kisumu. For many in East Africa’s economic powerhouse, the instability will also rekindle memories of large-scale ethnic violence that killed 1,200 people following a disputed election in 2007. President Uhuru Kenyatta, who won the annulled election by 1.4 million votes, has made clear he wants the re-run to go ahead and with the Supreme Court - the only institution that can delay it - unable to meet, it appears he will get his way. “God is great! The evil schemes to deny Kenyans the right to vote kesho (tomorrow) have failed. WE WILL DECIDE and move our country forward tomorrow,” Deputy President William Ruto said in a tweet. In his announcement on live television, Maraga said one judge was unwell, another was abroad and another was unable to attend after her bodyguard was shot and injured on Tuesday night. It was unclear why the other two were absent. Election board lawyer Paul Muite said Maraga’s statement meant the election would proceed as planned. “It means elections are on tomorrow. There is no order stopping the election,” he told the Citizen TV station. In the capital of Nairobi, hundreds of opposition supporters began to converge on Uhuru Park, waiting for Odinga to give a speech in which he promised to outline his strategy for election day. If the election goes ahead, it is likely to deepen the ethnic and political divides that have frequently sparked violence in Kenya, a key Western ally in a turbulent region. In a related ruling, High Court Judge George Odunga said some local election officials had been appointed in an irregular manner, but to withdraw at the last minute would only make an already dire situation worse. However, he admitted that not dismissing them could form the grounds for legal challenges afterwards. The Supreme Court has said it is prepared to annul the re-run, and send the country of 45 million back to square one, if it does not pass muster. Opposition lawyers seeking to challenge the Oct. 26 polls could also cite the failure of the election board to hold elections in all parts of the country, if enough polling stations are unable to open. In Kisumu, returning officer John Ngutai said that attacks by opposition supporters last week meant the election board had only managed to train 250 out of 1,300 staff they needed to hold the election in his constituency. Both the European Union and the Carter Center, an election-monitoring group run by former President Jimmy Carter, have said they will reduce their monitoring missions amid rising tensions between the Kenyatta and Odinga camps. Foreign observers were heavily criticized by the opposition in August for focusing on the vote, rather than the tallying process led by the IEBC election board. Kenya plunged deeper into crisis on Wednesday after a no-show by the majority of Supreme Court judges scuppered an eleventh-hour petition to delay a presidential election and the governor of a volatile opposition region endorsed rebellion against the state. Within minutes of Supreme Court chief justice David Maraga announcing that five judges had failed to turn up, preventing a quorum, hundreds of supporters of opposition leader Raila Odinga took to the streets of Kisumu, his main stronghold.